Latin American exports suffered a year-over-year decline of 9.1 percent in the first quarter of 2015, reflecting deterioration in export performance that has been observed since late 2014, according to a study by the Inter-American Development Bank (IDB). According to a quarterly update to the Latin American Trade Trends regional exports fell 2.7 percent in 2014, and the decline intensified in recent months, as exports fell sharply in the three months ending March 31, yielding a year-over-year quarterly decline of 9.1 percent. The report reveals that the export contraction was felt in all but three countries of the region in the first months of 2015. The Andean countries showed the most significant declines, averaging 19.2 percent. MERCOSUR countries reached a year-over-year drop of 13.7 percent. 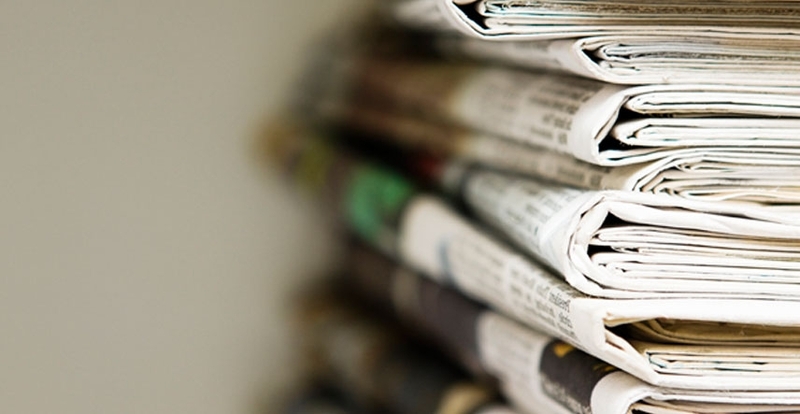 Central America and the Dominican Republic witnessed a reversal of the trend, as growth of the previous reading turned into a contraction of 4.6 percent. Likewise, Mexico’s exports, which had grown substantially in 2014, began to contract in the first quarter of 2015, yielding a year-over year reading of -0.4 percent. The report includes detailed data for 17 Latin American countries. 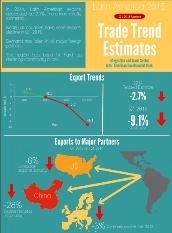 Source: IDB Integration and Trade Sector based on official national sources. 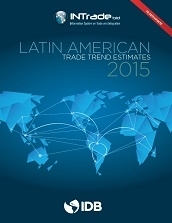 Notes: Complete data available in Latin American Trade Trends. Country groupings follow mainly geographical criteria. See Methodological Notes for further information on the procedures, time periods, and sources of data used in the estimates. Several factors, such as the appreciation of the dollar and the drop in commodity prices, primarily petroleum, led to the export contraction in Latin America in the first quarter of 2015. The dynamics of the region’s foreign sales is in line with the behavior of global trade which in January-March accumulated a year-on-year decline of 11.6 percent. In particular, imports of Latin American goods by the region’s three main trading partners fell by 28 percent for China, 6 percent for the United States, and 3 percent for the European Union.